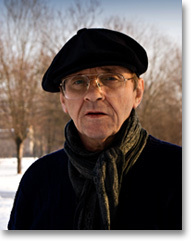 Arkadii Dragomoshchenko is a poet, prose writer, and translator. He was born in 1946 and studied philology and the theory of theatre in different universities. He has been a recipient of numerous Russian and international literary awards, including the Andrey Bely award for prose writing in 1978 and the Postmodern Culture electronic journal award in 1995. Several of his books of poetry (such as Description and Xenia) and prose (Phosphor and Under Suspicion) have been translated into various languages, including English. He himself is a noted translator of American poetry and a literary magazine editor, and has taught at St. Petersburg University, the University of California at San Diego, and SUNY Buffalo. He lives in St. Petersburg.